Access Docents to the Rescue! Our docent corps is a group of over 100 dedicated volunteers who are responsible for touring thousands of visitors through the Museum each year. DMA docents have a deep knowledge of the collection and work to craft their tours based on the interests and ages of their audience. 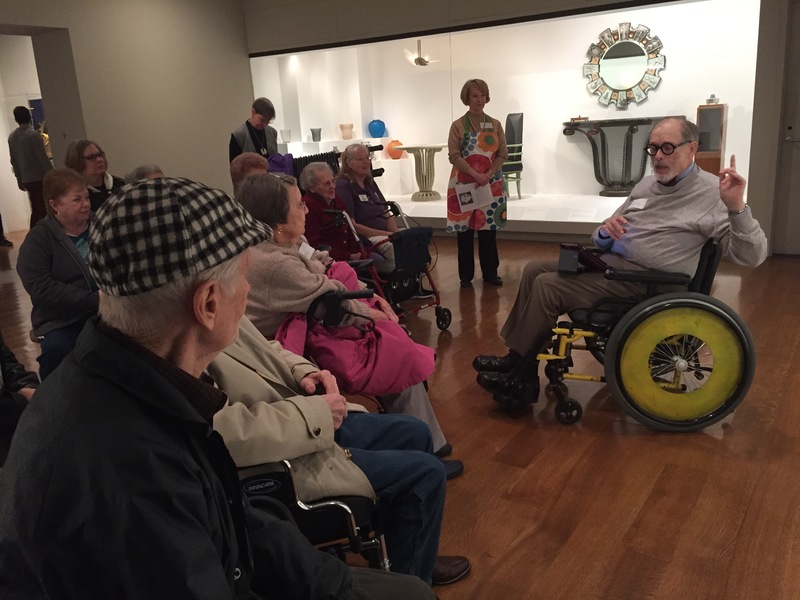 And this past year we initiated our first group of DMA Access Docents–volunteers who expressed an interest in helping with DMA Access Programs, in addition to the groups they were already touring! We began the program by meeting with a group of eight Access Docents each month to discuss access programming best practices and learn successful communication and teaching strategies for visitors with special needs. We welcomed a guest from the Alzheimer’s Association to share general information about Alzheimer’s and an autism specialist from TWU to speak about autism. This year, our training was more hands-on and consisted of observation and team teaching. 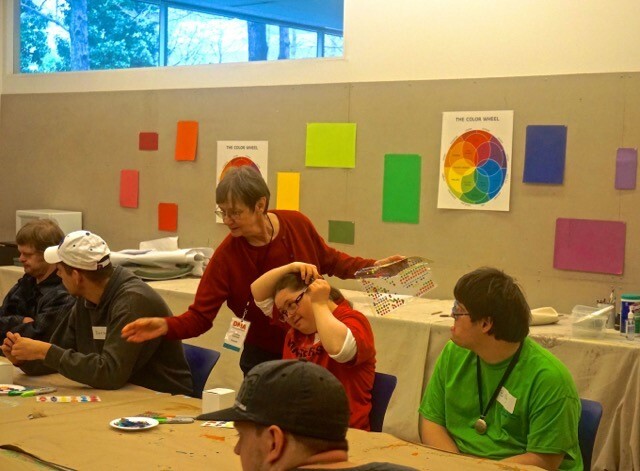 The Access Docents primarily help with our Meaningful Moments for Groups and All Access Art programs. Many of the docents volunteered with these programs throughout the year and got to know several of the regular participants. We’ve found that offering Access Program opportunities to our docents is a great way to share teaching responsibilities, which allows us to schedule more programs than we’d be able to if we only relied on staff. It is also a wonderful chance for staff to get to know the docents better and learn from them. We meet often throughout the year to touch base, brainstorm upcoming program themes, and share teaching strategies. Access Docents have shared with us the joy they feel when forming relationships and interacting with people from the same groups each month. Many of them have also mentioned that their access work has enriched their school tours: they re-purpose information and gallery games and incorporate them into tours. Since school tours generally don’t include a studio activity, many of the Access Docents have enjoyed the chance to use hands-on materials, integrating art-making into the Museum experience. We are thrilled to have such a passionate group of specialized volunteers helping us to teach our Access Programs!